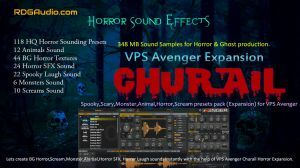 Churail Horror VPS Avenger - 348 MB Sound Samples for Horror & Ghost production. For the First time ever Horror, Spooky, Scary sounds are inside VPS Avenger. Churail Horror VPS Avenger is a sample based preset bank containing 118 Horror samples exclusively made for Vengeance Avenger.VPS Avenger. It has been created using our Foley Sound Library. All presets have been designed by our sound designers and professional music producers. 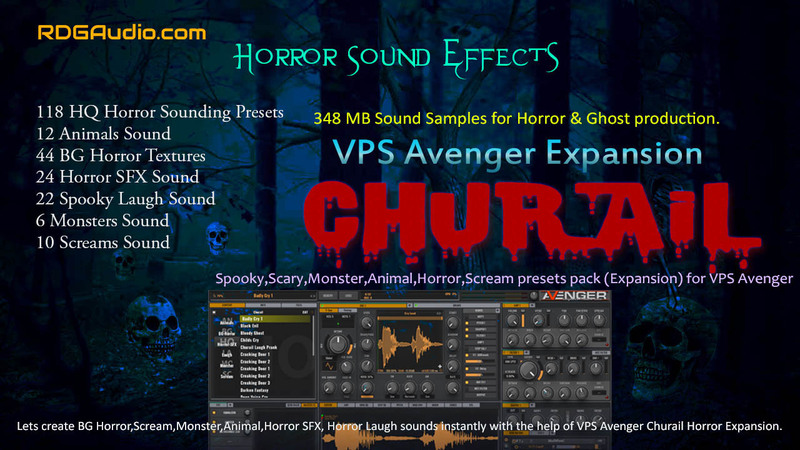 Lets create BG Horror, Scream, Monster, Animal, Horror SFX, Horror Laugh sounds instantly with the help of VPS Avenger Churail Horror Expansion. 118 HQ Horror Sounding Presets. 118 HQ Horror Sound Effect Presets for Vengeance Producer Suite [VPS] Avenger is here. The most versatile and best sounding Spooky, Scary, Monster, Animal, Horror, Scream presets pack you will ever have for the best Horror Movie, TV Shows or Short Film productions.